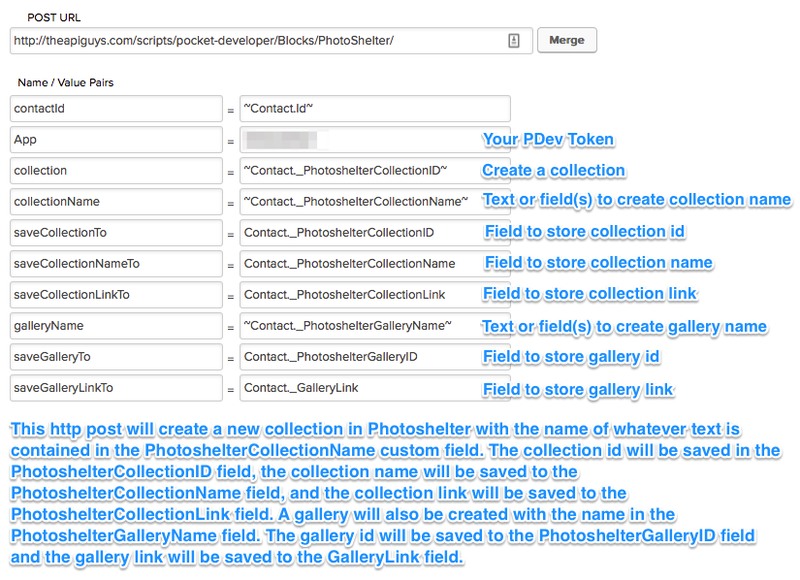 Create a new collections and/or gallery in Photoshelter from an HTTP Post in Campaign Builder, and save the collection/gallery id, collection/gallery name, and collection/gallery link to fields in Infusionsoft. Set permissions, passwords, and expirations for collections. The collection ID. Most often the value of this parameter will be the merge field where the collection id is stored. If the value is empty, a new collection will be created. The collection’s human readable name. Defaults to ‘Unnamed Collection’. The field to which the collection ID will be saved. The field to which the collection name will be saved. The field to which the collection link will be saved. The gallery ID. Most often the value of this parameter will be the merge field where the gallery id is stored. If the value is empty, a new gallery will be created. The gallery’s human readable name. Defaults to ‘Unnamed Collection’. Field to which the password will be saved. requires galleryPassword to be set. The field to which the gallery ID will be saved. The field to which the gallery link will be saved. A password to set for the collection. Field to which the password will be saved. Requires collectionPassword to be set. Defaults to null, which is view only access. Options are ‘original’ or ‘jpeg’. requires collectionPassword to be set. Defaults to unlimited. Send any number to set a maximum. Requires collectionPassword and collectionDownloadType to be set. Field to which the password expiration date will be saved. requires collectionPassword to be set. A password to set for the gallery. If none is sent, will inherit from collection. Password Expiration date in any readable format. requires galleryPassword to be set. Defaults to null, which is view only access. Options are ‘original’ or ‘jpeg’. requires galleryPassword to be set. Defaults to unlimited. Send any number to set a maximum. Requires galleryPassword and galleryDownloadType to be set. Field to which the password expiration date will be saved. requires galleryPassword to be set. To fully utilize this plugin, you may need up to ten Infusionsoft fields to store collection id, collection name, collection link, gallery id, gallery name, gallery link, collection password, collection password expiration date, gallery password, and gallery password expiration date.